This high-end 5 hotel sits atop cliffs overlooking the Aegean Sea, within walking distance of the picturesque town of Oia, and offers an infinity pool with spectacular views of the sea. Children under 16 are not allowed in the Perivolas Hotel for security reasons. This spacious suite has whitewashed walls and a living area with an open or independent bedroom. It opens onto a terrace with views of the Caldera. This suite offers a private terrace with views of the Caldera, whitewashed walls and period furniture. Includes open-plan living area with 1 bedroom and bathroom with stone walls. The studios, sculpted in a traditional way in the landscape, have an open plan living area with a large bed, handmade cotton rugs with bright colors and a terrace with views of the Caldera. This suite features a spacious terrace with sea views, whitewashed walls, soft curves, a bedroom, a seating area and a bathroom made of Santorini stone. This suite features an open-plan interior design and features a built-in bed, a seating area, an outdoor hot tub and a private terrace overlooking the Aegean Sea. This suite features 1 semi-private bedroom, a large separate living room with 1 king size bed, and luxury bathroom with steam room. 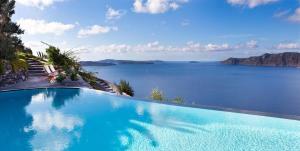 It also includes a terrace with panoramic views of the Aegean Sea and a heated pool with hydromassage jets. This suite has 1 separate bedroom with private bathroom and 1 double bed, and a large vaulted living room with 1 king-size bed. It also includes spa facilities with a steam bath and a pool with a hydrotherapy massage system. 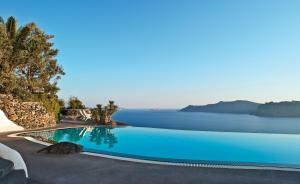 The heated cave pool opens onto a terrace with views of the caldera. Suite excavated in a cave, which was once the home of a local winemaker, is characterized by whitewashed walls and vaulted ceiling in the bedroom. It includes a spacious living room decorated with handmade carpets and cushions and a terrace that has an infinity pool, which seems to merge with the Caldera 300 meters below.